Spartanburg School District 4 participates in the South Carolina State Department of Education's Teacher of the Year program. Each year, the district's four schools select a Teacher of the Year. The district Teacher of the Year is then selected from the schools' Teacher of the Year candidates through an interview process. Jennifer Smith may very well have her dream job. She loves students and she loves the written word. It appears that her daily goal is helping students to develop a strong appreciation of books, language, and especially poetry. This is why Woodruff Middle School named Jennifer Smith as its Teacher of the Year. 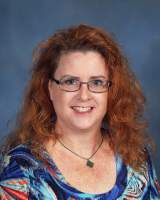 Mrs. Smith is in her 20th year of teaching at WMS where she teaches 6th grade English/Language Arts. Mrs. Smith holds a bachelor’s degree from USC-Upstate and a master’s degree in English and creative writing from Southern New Hampshire University. Before coming to WMS, she taught three years at St. Paul’s Catholic School in Spartanburg, SC. When not working with young people, Mrs. Smith can be found enjoying yoga, bowling, reading, painting, and writing poetry; she has creative writing published in several journals.